If you thought that choosing the right lens and camera or the never–ending Nikon vs. Canon discussions were tough subjects, then welcome to the unyielding matter of choosing the right camera bag. As with so many things in photography, there simply is no such concept as the perfect bag or a bag suitable for all situations. If you practice photography long enough you are bound to go through a number of them ending up using at least two for different purposes. Whereas there are some common denominators, arriving at the right bag takes personally using them, as it is the only way to account for individual preferences and styles of shooting. Furthermore, a camera bag can be fully evaluated only over a long period of time—one can determine fairly quickly whether general attributes of a bag, i.e. its type (backpack, shoulder or waist bag) and size are suited for a particular style of shooting and photographer's preferences; however, other aspects such as quality of zippers, positioning and size of side pockets, etc., take a longer time to be appreciated or become annoying. In this article I am going to look at some of the types and brands of camera bags that I have used in hope that it might be of use where my experience correlates to your personal considerations. I reckon most serious photographers start with a small or medium sized shoulder bag. This usually happens when one adds a second lens and, possibly, a flash to the basic one–camera–one–lens setup. Shoulder bags at first seem like a great option as they allow having all your gear in one place and accessing it fairly quickly for shooting. My first small shoulder bag was a Lowepro Nova 4 and it served me quite well. The problem with small shoulder bags, however, is that one outgrows them sooner rather than later—add that 70–200 f/2.8 lens or a few other pieces of equipment to your gear collection and you have crossed that line. Do not write small shoulder bags off your list yet, though, as they are still the best choice when you want to carry only a basic camera kit with accessories and miscellany. My Nova 4 was later replaced with a ThinkTank Speed Freak as the latter is pretty much the perfect medium sized bag—it serves as both a shoulder and a waist bag, can accommodate a 70/80–200 f/2.8 lens and is superbly built and thought out. When you realise that your first shoulder bag is no longer big enough, getting a bigger shoulder bag appears a natural and reasonable solution. However, it is the presumption that handling of a bigger shoulder bag will be similar to that of a smaller one that gets one in trouble. And that trouble is twofold: first, carrying the weight that a fully loaded big shoulder bag can accommodate is a challenging task; second, handling is compromised as big shoulder bags normally have a two–layer configuration and the gear you put at the bottom is not readily accessible. The big shoulder bag that I bought was a Lowepro Stealth Reporter 500 AW. While the bag itself is well thought out and made, the shoulder strap that came with it was rather pathetic. I was suggested to buy a separate one but was reluctant to spend the money and simply used the shoulder strap from the Nova 4. I used the Stealth Reporter 500 AW for several months and grew quite wearisome of the accessibility issues. The main reason why it ended up being put in the closet, though, was that shoulder bags put asymmetrical pressure on your body and, due to this, do not carry weight well at all. A couple of long hikes convinced me that I needed an alternative solution. 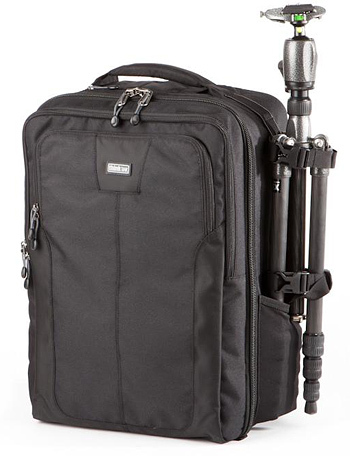 This being said, this is the bag that I would turn to if I have to cover an event with a considerable amount of gear (two camera bodies, a couple of pro–grade zoom lenses and accessories). As you might have already guessed, the alternative solution came in the form of a backpack. Backpacks have some very solid advantages over other types of bags: first, they are most comfortable to carry for extended periods of time; second, being a single–layer design they allow quick access to all your gear. Backpacks, however, have their drawbacks, too. First, the SOP (standard operating procedure) includes the steps of taking your backpack off your shoulders, putting down and unzipping it each time you want to photograph, and then going through the reverse sequence after you are done photographing. This probably sounds acceptable, but do it a couple dozen times in a day and you start asking yourself if the scene before your eyes is worth going through the movements again (remember that backpacks can accommodate quite a lot of gear and tend to be heavy). Second, putting a backpack down often means putting it into dust, sand or mud. And the part of the backpack that gets dirty then goes onto your back and shoulders. This, of course, does not influence the quality of your pictures, but I would not call it elegant either. The first backpack that I came to own was a Lowepro CompuTrekker Plus AW. At the time of purchase it seemed like a very sensible choice—it seemed well made and of the right size; I thought that there would come a day when I would carry a notebook computer with me and the bag would accommodate it perfectly (as of early July 2008, this day has not come yet and I do not envision it coming any time soon). Apart from that, the AW (All–Weather) feature seemed very attractive, too (but more on this later). After several years of use I am happy to report that, generally, the CompuTrekker is a very good backpack. As expected, it is fairly solidly constructed and has the perfect size for my needs. I have grown very fond of the big zipping front pocket and particularly appreciate that the waist belt is removable—I use it when hiking in the mountains and simplify the backpack to a no–frills configuration when doing other types of photography. The CompuTrekker, however, has a couple of fundamental flaws. First, the zippers of the main compartment and the front pocket are identical—you often confuse them and tend to pull the wrong one, which is especially annoying when you need to get to your gear fast. This might sound like a really minor imperfection but it becomes a major nuisance over a longer period of time. The second flaw is that the zipper of the main compartment is simply inadequate for its intended purpose. On top of that, its design is such that the nylon zipper puller rubs against the fabric that covers the zipper and it is only a question of time when it breaks. This, of course, happens at exactly the wrong time; when mine broke, though, I, fortunately, had spare boot laces with me and used one to replace the puller. I have to also note that the term "All–Weather" might be a bit misleading. The CompuTrekker has a rain cover stored in a flap at the bottom of the pack; come rain and all you have to do is pull it out, cover the bag and tighten the drawstring. This works perfectly for light sprinkle and/or for short periods of time; for anything other than that it is inadequate because of the flawed design—shoulder harness is attached to the top of the backpack and, because of this, the hood cannot entirely cover the backpack from the top. I once happened to hike for several hours in heavy rain and all the gear in the backpack, not to mention the pack itself, was drenched. Note that the first thing to get wet will be your laptop computer. The drawbacks of the CompuTrekker had me looking at other possible options and that is when my attention was drawn to the products of ThinkTank. After careful consideration I became an (initially excited) owner of an Airport Antidote backpack. The Airport Antidote is smaller than the CompuTrekker and this makes it more travel–friendly; nonetheless, it is big enough to accommodate my complete Hasselblad system (503CW and Flexbody camera body, two film backs and three lenses) with accessories and film. The bag boasts a noticeably better construction than the CompuTrekker and in many aspects is better thought out. However, after several trips with the pack I realised that it obviously was designed for photographers who travel and photograph in ways different from those of yours truly (or, put differently, I realised what features I have to have). First, instead of a zipping front pocket the Airport Antidote has an unzipping stretch pocket that is designed to hold a laptop case. Every photographer has different needs but I personally have to have a big zipping front pocket. This is where I normally put all the items that I want to have quick access to while en–route without having to unzip the main compartment. Such items include a mobile phone, an iPod (or, more recently, a 16GB iPhone instead of these two gadgets), a notebook (no, not a computer, just a plain paper notebook), a book and other miscellany. I am very reluctant to carry these items in a separate bag and having them in an unzipping stretch pocket is highly uncomfortable and unsafe. Second, Airport Antidote also includes a rain cover but, unlike CompuTrekker, it is not stored in a flap at the bottom and has to be carried separately. This means that you either lose/forget it or have to put it inside the backpack. The former undermines the whole idea of having a rain cover; the latter is very questionable as it wastes space in the already smallish bag. In relation to the last point, using Airport Antidote also made me appreciate that I have to have enough working space in my camera bag. Being able to stuff all your gear into your backpack is not enough; you have to have a bit of extra space for handling lenses and accessories or storing other miscellaneous items. From this perspective, the size of Airport Antidote is acceptable for short photographic expeditions; the size of CompuTrekker, however, suits my needs better. In summary, backpacks are by far my preferred type of camera bags for serious work, and I use either the CompuTrekker or the Airport Antidote depending on how far I envision to go, how much gear and other stuff I want to pack and, well, just my mood. For serious one–day photographic undertakings in urban areas or event photography I might use the Lowepro Stealth Reporter 500 AW instead. And when I want to go light and only carry a fairly basic camera kit, be it medium format (film) or DSLR, ThinkTank Speed Freak shoulder/waist bag is the perfect companion. Continuing from where I left off above, the zipper of my Lowepro CompuTrekker Plus AW backpack irreparably broke down shortly after I wrote the article, and I replaced it with a ThinkTank Airport Acceleration v2.0. At about the same time I also sold my ThinkTank Speed Freak shoulder/waist bag, because it turned out to be too small for a shoulder bag and too big for a waist bag. The changes, however, did not stop at that. Lowepro Nova 4. This was my first shoulder camera bag. I used it quite a bit when I just bought it, but during the past several years it stayed in the closet for so long that I nearly forgot about its existence. As I mentioned before, shoulder bags are just not my cup of tea. Lowepro Stealth Reporter 500 AW. This was my second shoulder bag. Again, I am not in favour of shoulder bags, not to mention that, fully loaded, it has accessibility issues and is too heavy to lug around as it puts asymmetrical pressure on your body. Billingham Hadley Large Camera Bag. To be honest, I have no idea why I bought this bag. Looking back at it now, the decision was completely irrational—I just wanted it. But then again, how many decisions in our life are rational? Having so far irrationally bought only one bag, it is not that bad in my book. I used the bag a few times, never got to really like it, and it stayed in the closet most of the time. ThinkTank Airport Antidote. This backpack served me really well and accompanied me on numerous photographic expeditions from mountains near Tibet to Kamchatka peninsula in Russia. However, two drawbacks really annoyed me: first, it is over–padded for my needs; second, I got really tired of the unzipping stretch front pocket. ThinkTank Airport Acceleration v.2.0. This bag was a bit of a miscalculation on my part. On the one hand, I wanted a bigger backpack than the Airport Antidote, but this backpack turned out to be too big: fully loaded, it really weighs you down (if you do not intend to fully load it, you may as well use a smaller bag). On the other hand, although design of the front pocket was improved, it still remained largely funky and impractical. I used this bag two or three times only. ThinkTank Airport Commuter. While this backpack is similar in size to the Airport Antidote, it is less padded and thus has more space inside. It also has perfect zipping front pockets—at long last! On top of that, lots of small details have been improved, too, thus making it an even better thought out product. I am yet to use it in the field, but given my previous experience I have every reason to believe that it is the best backpack for my needs that I have ever used. Lowepro Photo Runner. I bought this waist bag after selling the ThinkTank Speed Freak. Quality of materials is so–so, and I had to modify it slightly by cutting off supporting straps, which I found totally unnecessary. Again, I am prepared to spend the money to get the best camera bag in this class, but the Photo Runer is the most suitable waist bag for my needs that I have seen so far. While I feel quite comfortable with the above combination, optimising one's collection of camera bags is an endless quest, so you can count on me writing another update in a few years. *As I have mentioned a number of times, buying quality gear pays off in the long run. Selling these bags generated enough cash to buy the Airport Commuter and savour a few bevvies!